Researchers at North Carolina State University have for the first time identified a specific chemical used by the higher termite castes — the queens and the kings — to communicate their royal status with worker termites. The findings could advance knowledge of termite evolution, behavior and control. A study published in Proceedings of the National Academy of Sciences shows that a wax-like hydrocarbon — a chemical consisting of only carbon and hydrogen atoms called heneicosane — on the body surface of subterranean royal termites is used to enable worker termites to recognize and care for them. Termites live mostly underground or in wood and are generally blind, necessitating the use of chemical signals to communicate. "This is the first report of a queen recognition pheromone in termites and the first report of a king recognition pheromone in insects," said Coby Schal, Blanton J. Whitmire Distinguished Professor of Entomology at NC State. Schal and NC State Ph.D. graduate Colin Funaro, the paper's co-corresponding authors, used gas chromatography to isolate specific chemicals from the exoskeletons of royal and worker Reticulitermes flavipes termites and found heneicosane on the royal termites, but not on workers. When heneicosane was placed on glass dummies serving as royal termite proxies, workers did not bow or curtsy, but instead started shaking — an action that seemed to reflect the termite version of royal recognition. Workers shook even more when the royal pheromone was blended with other hydrocarbons from the colony's workers that represent the colony's odor. "Termites use a two-step recognition process – the colony's odor gives workers a 'home' context and heneicosane within this context denotes 'royals are in the home,'" Schal said. "The royal-recognition pheromone lets workers know that there is a queen or a king present and that everything is stable in the colony," Funaro said. 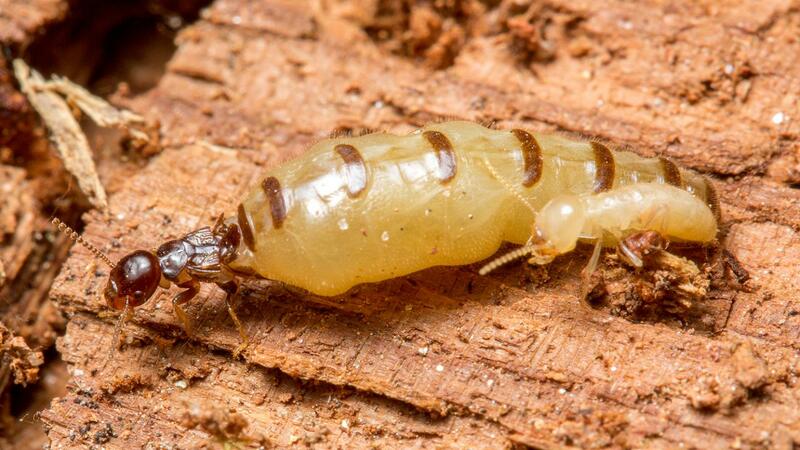 "Worker termites shook more when realizing that the royals were also nest mates." "Termites appeared some 150 million years ago while the social Hymenoptera appeared about 100 million years ago, so this discovery of a hydrocarbon as a royal-recognition pheromone in termites appears to predate its use in social insects," Schal said. Ed Vargo of Texas A&M University (formerly a professor at NC State) and Katalin Boroczky of Penn State University (formerly a postdoctoral researcher at NC State) also co-authored the paper. Funding for the work came NC State's Blanton J. Whitmire endowment. Abstract: Chemical communication is fundamental to success in social insect colonies. Species-, colony-, and caste-specific blends in cuticular hydrocarbons (CHCs) and other chemicals have been well documented as pheromones, mediating important behavioral and physiological aspects of social insects. More specifically, royal pheromones used by queens (and kings in termites) enable workers to recognize and care for these vital individuals and maintain the reproductive division of labor. In termites, however, no royal-recognition pheromones have been identified to date. In the current study, solvent extracts of the subterranean termite Reticulitermes flavipes were analyzed to assess differences in cuticular compounds among castes. We identified a royal-specific hydrocarbon–heneicosane–and several previously unreported and highly royal enriched long-chain alkanes. When applied to glass dummies, heneicosane elicited worker behavioral responses identical to those elicited by live termite queens, including increased vibratory shaking and antennation. Further, the behavioral effects of heneicosane were amplified when presented with nestmate termite workers' cuticular extracts, underscoring the importance of chemical context in termite royal recognition. Thus, heneicosane is a royal recognition pheromone that is active in both queens and kings of R. flavipes. The use of heneicosane as a queen and king recognition pheromone by termites suggests that CHCs evolved as royal pheromones about 150 million years ago, about 50 million years before their first use as queen-recognition pheromones in social Hymenoptera. We therefore infer that termites and social Hymenoptera convergently evolved the use of these ubiquitous compounds in royal recognition.